Do you know a PEC award winner? 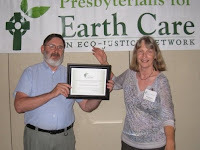 • Nominate a deserving person or organization to receive one of two Presbyterians for Earth Care Awards. Gibson Lifetime Achievement Award is presented to an individual whose faith-based work for the environment deserves recognition. Rev. 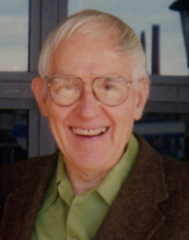 William Gibson was a founding member of PEC, author and eco-justice advocate, and editor of the book, “Eco-Justice – The Unfinished Journey.” Previous awardees include the Rev. William Gibson and our other founders, the Revs. Bill Knox and John Jackson. The Restoring Creation Award is given to a faith-based organization including congregations, governing bodies, ecumenical agencies, and Presbyterian-related entities for environmental work that is particularly praise-worthy. Montreat Conference Center and Warren Wilson College have received this award in the past. We generally look for award nominees within the Presbytery or general region of the conference: North Carolina or Southeastern US. However, nominations from other areas or regions are welcome. Click HERE for more information about the awards, the Rev. William Gibson, and previous award winners. If you are not a member or your membership is not current you can join or renew today. Then go to the nomination form and fill it out with your favorite awardee. Please submit your nomination by August 1st. Writing Inhabiting Eden: Christians, the Bible, and the Ecological Crisis revolutionized my thinking about the earth and its inhabitants as seen by Scripture’s writers. Subsequent work with congregations has led me to further questions: What strengths, or virtues, are being called forth among those who care for creation? How are these gained? What does an ecologically sustainable future look like, and how can we know it when we see it? 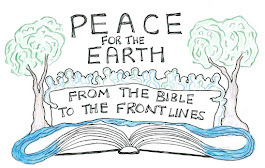 In my keynote lectures at the Presbyterians for Earth Care Conference at Montreat, I plan to explore these themes: the human role as Scripture’s writers imagine it; the shape of social movements and their leadership; and compelling visions for a healthy, just, and satisfying future. First, in “Rethinking Scripture, Humans, and Creation,” I will explore assumptions Scripture’s writers held that may surprise and help us now. The metaphor of “dominion” that has so captivated modern thinking is neither Scripture’s only nor its most realistic model. The Bible offers other visions of humanity that are both healthier and truer to our experience, inviting both critique of human powers and humility before nature. Not only creation stories but the Pentateuch’s teachings, Psalms, prophets, and wisdom give food for imagination and guidance for action. Yet every new thing that humans seek to do confronts us with the problem of imagining a future that is largely unknown, unfolding before us without a roadmap. While each paradigm shift that has preceded us is by definition unique, some common elements can be found in stories from our past that will help us choose our actions now. My second lecture will discuss “Creating Social Movements for Change,” as it pertains to faith communities guided by the moral demand to promote ecological sustainability. In my third lecture, “Shifting to a Flourishing Future,” I hope to envision what we Earth Care Presbyterians are aiming toward. Apocalyptic scenarios of an overheated planet are all too clear to environmentalists passionate about averting climate change. What is more difficult is to imagine—and appropriate—visions of the world that we wish to see emerge. No one can predict the future, but the more clearly we imagine the society we are aiming for, the more readily we will recognize solutions that lead toward it. The Rev. Dr. Patricia (Trisha) Tull is a Presbyterian teaching elder and A. B. Rhodes Professor Emerita of Hebrew Bible at Louisville Presbyterian Seminary and author of several books, including Inhabiting Eden: Christians, the Bible, and the Ecological Crisis. She is a Climate Reality presenter, a GreenFaith fellow, and in addition to writing and teaching widely on Scripture and environmental issues, she works as affiliate developer for Hoosier Interfaith Power and Light.